Card Text Ether Spider deals no damage when fighting. If my opponent has an Ether Spider in play and I play Bait and Switch, would I steal all of my opponent’s Æmber? Yes. When each Æmber is stolen by Bait and Switch, it goes directly to your opponent’s Ether Spider. And since only Æmber in your own Æmber pool is considered “yours” for the purpose of card effects, each time you steal Æmber, you still won’t have any in your pool, and Bait and Switch will continue to trigger until your opponent no longer has more Æmber than you (i.e. when they have zero Æmber). 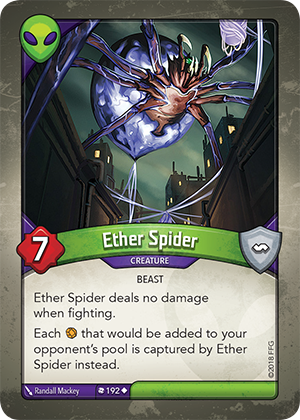 Does Ether Spider’s ability affect Æmber gained from stealing? Yes. All Æmber that would be added to your opponent’s pool is captured by Ether Spider, including Æmber from reaping, stealing and gaining.